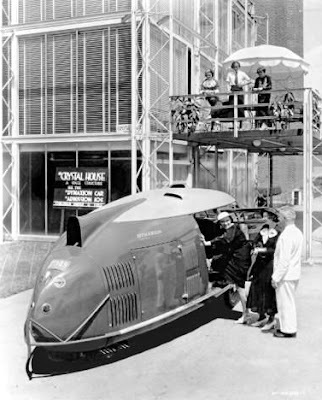 July 29, 1934 – The Dymaxion, a three-wheeled automobile, arrives at the Century of Progress World’s Fair with Buckminster Fuller, its designer, driving the vehicle onto the fairgrounds where it will be exhibited at the Crystal House on Northerly Island. Nineteen feet long with front wheel drive and a single wheel at the rear, the car is capable of traveling at 120 miles per hour. The photo above shows the Dymaxion beside architect George F. Keck's "Crustal House" on Northerly Island. July 29, 1936: The motor ship Material Service sinks early in the morning a mile north of the lighthouse at Eighty-Sixth Street as she is caught in an open-water gale for which she was not designed. Although seven members of the crew are rescued, Captain C. D. Brown and 15 other crewmembers die. First Mate John M. Johnson says upon his rescue, “We were going along as usual when suddenly the vessel listed to port. Then it came back on an even keel, but immediately began to sink. 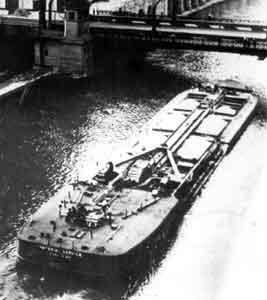 We had the usual complement of lifeboats, but the sinking was so sudden that there was no chance to launch them.” [Chicago Daily Tribune, July 29, 1936] The ship had hauled a load of gravel from Lockport to Chicago, and had left the mouth of the Chicago River around midnight, headed south for a dock in the Calumet Harbor area when disaster struck.